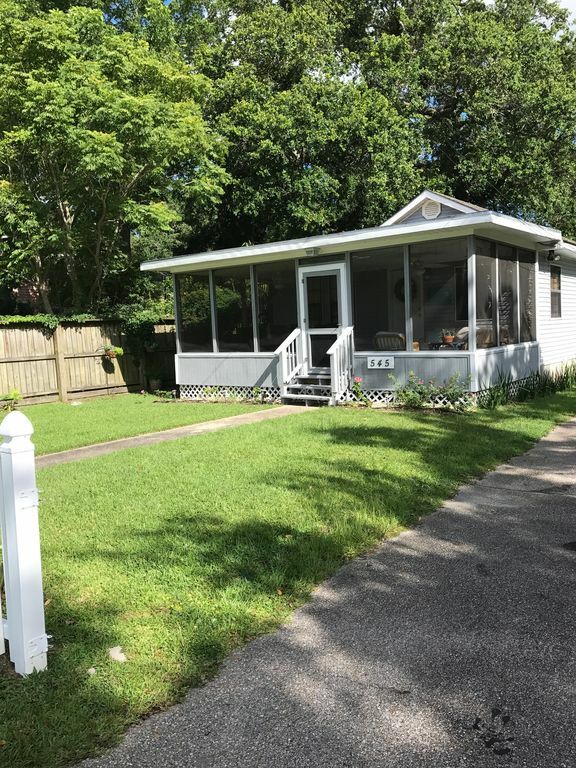 Well-equiped vacation home near amenities and beach in Pass Christian. Once you enter the outdoor living space on our screened porch with comfortable rattan sofas and ceiling fans to keep you cool you may want to stay put for the remainder of your stay. The outdoor dining table seats six and is a great spot for morning coffee and afternoon drinks. Living room has comfortable couches and recliner as well as a small table for games or meals and a 39 inch smart TV. Kitchen is well equipped for cooking and eating in with quality cookware for the Cajun cook, dishwasher and seating for 6. Comfortable beds and TVs in all bedrooms. Master bedroom has king bed, queen bed in middle room and twin beds in front room.. Two bathrooms - front bathroom with tub, back bathroom with shower and seat - are stocked with linens and swim towels. Back covered patio with swing and charcoal and gas grills overlooks fenced, grassy backyard for running and playing. Ride bikes around town to restaurants and scenic areas as well as walk to the beach and park. Washer and dryer available in house for your use. Nearby coast attractions include delicious restaurants, casinos, harbors, pier fishing, parks, museums and beach rentals such as jet skis, paddle boards, paddle boats, etc..
Forty years ago I drove through the Pass and was smitten by the beauty and charm of the area. Little did I know that I would meet a nice man from Pass Christian following Hurricane Katrina while on a mission trip with my church to help in the recovery and fall in love and have the opportunity to own a home with him here. John Hayden, Jr. grew up in this house that his dad built with his own labor, buying lumber each payday and building a bit during the week after work.. Though we live in Texas, John and I have the privilege of enjoying this house and time with his siblings who live in the Pass and come over as often as we can. We hope you enjoy your time here as much as we do! Large grassy backyard for games, running and playing. Fenced area for dogs. Electric lift by back door. However, there are no ramps in or out of house so assistance will be required to move through doorways. This house was lovely - cute and well-stocked in a nice little neighborhood. The screened porch was fantastic for morning coffee, playing cards, and evening cocktails. Bicycles were a wonderful addition and restaurants were close by. We would definitely stay here again! We three women had such a lovely time at the Hayden Cottage. It is comfortable, roomy and was equipped with everything we needed. The location is perfect for downtown Pass Christian and we also took in Ocean Springs and Bay St. Louis. The front porch was wonderful for eating and visiting. So nice! Definitely on our places to revisit! Very nice place. Perfect location for us and you can not find a more accommodating hostess. Throughly enjoyed the house and the owner was so accommodating. Cute cottage with a great location! This is the second year we have stayed at the Hayden Cottage. We find it to be very comfortable and perfect for our needs. We love the fact that we can bring our kitty, too. The cottage is so well supplied with all the extras like paper products, laundry supplies, garbage bags and even some spices and other cooking ingredients that we can use if needed. We have especially enjoyed sitting on the screen porch in the afternoons and evenings. We have already booked our return for next February at the Hayden Cottage. Wonderful vacation experience! This house is well out-fitted with everything you will need ! The house is very cute and clean, with a great floor plan. The kitchen is well stocked. The bedding is comfortable. Great location. Great communication during rental process! THANKS !! Charges made to Amazon Prime for movies or TV shows are additional.